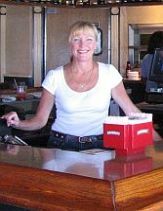 This is your guide the Nautical Mile restaurants. Here you'll find a picture and a short description of each one with a link to a more detailed review. I don't think there's a place on Long Island with as many restaurants as Freeport's Nautical Mile. With close to 2 dozen in all the choice of food, atmosphere, and price is almost endless. Most feature outdoor dining areas and many of the restaurants host live music from afternoon until night. With so many options choosing a restaurant might seem daunting, but it isn't. The restaurants on the Nautical Mile are so close together that you can visit every single one of them in a single afternoon, and most post menus right on their doors. As you walk the promenade look at the menus, listen to the music, and don't be shy about peeking inside (or on other diner's plates). If you like what you see then maybe have a drink at the bar before moving on. Left: Jeanine will make you feel right at home at Blue42. Take mental notes throughout the day and by sunset you'll have an appetite and probably know exactly where you want to eat. Well, maybe not. There are a lot of choices here and I always have trouble finalizing the “where shall we have dinner” decision. Right: With a smile like that who needs beer? 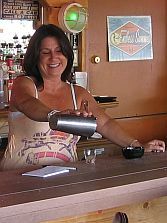 Say hi to Kelly, the bartender at Water Lillys. What follows is a complete listing of all the Nautical Mile restaurants organized by location. If you start walking at the head of Woodcleft canal you'll encounter each restaurant in the order given below. As much as I'd love to, I can't possibly eat at, and review every one of these restaurants in a reasonable amount of time. So... If you've dined on the Nautical Mile, please help me out a little by sharing your experience with other Loving-Long-Island.com readers. This top rated restaurant features two story dining, indoor bar, and large outdoor bar. The emphasis is seafood, but there’s something here for everyone, even the kids. This Nautical Mile restaurant features one outdoor and two indoor dining areas. Menu offers pasta, poultry, seafood, steak & fowl. Spacious dining room with lots of windows and water views. Menu heavy on steaks and fish with some veal, poultry, and fowl for good measure. Extensive wine list. Famous for their homemade banana bread. This unique outdoor only raw bar / bar & grill is great for a beer and a bite right on the water. Excellent bar scene, but probably not the place for kids. A fixture on the Nautical Mile for 30 years, the Crabshack is all about fresh fish at reasonable prices. Menu offers classic baked, broiled, and fried fish, as well as a large selection of Italian style favorites. And yes, they serve crabs too. One of my favorite Nautical Mile restaurants. Great for a beer, a burger, and a little live music. Home of Freeport's Famous Chili and the Special Burger, Water Lilly's serves up fresh fish, sandwiches, and low carb specials as well. Menu offers contemporary, traditional, Cajun, and Thai style seafood alongside steaks and burgers. Indoor bar faces Woodcleft canal for some nice water views. Indoor dining room can be uncomfortably loud when band is playing. I can't say much about this place. I've never eaten here and when I walked in to take pictures for this article I was treated with indifference by the manager. Looks like a nice place though. Italian pizzeria/restaurant serving pizza, burgers and chicken. An antidote, if you will, to the typical Nautical Mile menu. A pub in the true sense of the word. Don't wait to be seated, order your food at the bar. 16 brews on tap, bar menu with seafood classics. Donate you bra to the collection hanging from the ceiling and drink free beer all night. Beautiful dining room and bar overlooking the canal. Spacious and clean waterside & street side dining. Another one of my favorite Nautical Mile restaurants. Run by the same family now for nearly 80 years, Otto's is one of the hot spots. Good food, music, and spacious outdoor dining keep me coming back. And, this is where Rocky the Dancer hangs out. Excellent seafood, steaks, burgers and wraps keep people coming back to Rachel's. Try their Japanese Tuna "Nachos" made with rice paper, and order your fish prepared in any of 5 different styles. Spillover music from Otto's is at an enjoyable level. The only sushi restaurant on the Nautical Mile. Extensive sushi, sashimi and hibachi menu. Polite service from Japanese waitresses in traditional dress. Ask for a tatami room on the waterside wall for a beautiful dining experience. An extension of Cap't Ben's Fish Dock Bracco's serves what the could be the freshest fish on the Nautical Mile. If you're a fan of Ipswich clams you'll find them here. Huge outdoor dining and bar area. Quick service from polite staff. Boisterous crowd. This lively restaurant features fresh fish, great steaks, poultry, and pasta in a beautiful 1940's fish house setting. Raw bar offers a selection of regional oysters. Enjoy an oversize martini or fresh squeezed screwdriver while listening to live music Thursday through Sunday. CLOSED! This place was a throwback to the 70's that served fresh seafood broiled, fried and Italian styles. Kid's menu and a few token dishes for land lubbers. All deserts were made on premises. Large deck on the canal. Slips were available for those arriving by boat. Seating for 350 makes this the largest of the Nautical Mile restaurants. Multiple dining rooms and decks, extensive up to date menu offers something for everyone and lobsters up to 4 pounds. Outdoor seating overlooks Middle Bay. So there you have it. That's all of the Nautical Mile restaurants. Everyone loves to brag about their favorite restaurant. What's yours? Give us 500 words (2500 characters) or more if you want about what you like about this restaurant. Tell us all about the food, service, prices, decor, your favorite dishes and other recommendations. If you have pictures, great, send them along with your review. No pictures? No problem just send us a great review. Also, please make sure your review is at least 2500 characters long.